The E3 LED Task Light delivers powerful LED lighting with a compact frame. The E3's lamp head is adjustable 175 degrees. Angle it to fit your space. The E3 LED Task Light comes in black, white, or silver finishes to match your UPLIFT Desk. A USB port on the back of the lamp's base provides a dedicated charging station. Use touchpads to control the E3's brightness and hue. The combinations are endless! The lamp head is collapsible, to give the E3 a slim, discreet profile when it's not in use. Add an E3 LED Desk Lamp to your workstation for exceptional control over your workstation's lighting. Why do I need a task light? If you need more or directed light for your work, or you find that your eyes get tired, a task light can help you. Work with fewer headaches and less eye strain and fatigue. An adjustable task light will give you the best brightness, color, and angle for what you're doing. Just like periodic standing and good lumbar support are good for your body, the right light is good for your eyes and your mood! 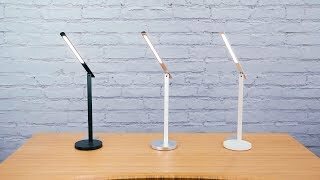 The E3 LED Desk Lamp offers you fine control over your light levels and color temperature with endless light settings: five brightness adjustments and stepless color temperature adjustment between 6500K and 2700K. Just touch and hold the power button to cycle between warm, cool, or neutral lighting, and run your finger over the half circle control under the power button to brighten or dim your light. Want quick access to a preset brightness? Tap the same half circle control to cycle between five pre-programmed values. Does the lamp come in any colors? Enjoy a modern aesthetic with black, white, and silver color options. Is the lamp's head adjustable? The E3 LED Task Lamp's energy efficient LEDs have a 30,000 hour lifespan, for years and years of well-lit work and play. Unlike a fluorescent or old incandescent lamp, you won't have to change any lightbulbs. Of course! You can charge your phone or other devices with the convenient USB charging port on the base, so you won't have to occupy your computer USB ports or power outlets, or keep track of adapters. Keep your most-used devices in easy reach on your desktop! This chic task lamp is a sight for sore eyes in more ways than one. Match your office style with a black, white, or silver color finish on this eye fatigue-relieving lamp.